It doesn’t matter whether you visit churches or not, whether you are a religious person or not, however there are the most unusual churches in the world and they are odd, extraordinary, strange, amazing, fantastic – odd, you name it. They make our planet or a single country worth visiting. 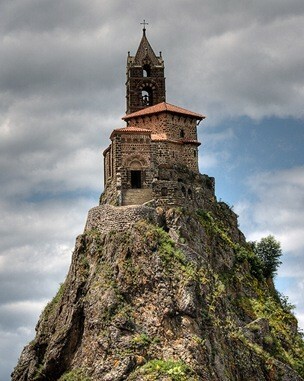 Today I would like to share with you a picture of one of the most beautiful churches in the world – Saint-Michel d’Aiguilhe chapel (Le Puy-en-Velay, France). I perfectly know what France is popular for – its amazing Tower, friendly people, delicious breakfast and buns, fantastic boutiques and… a church that most people have even never heard of … but it definitely belongs to one of the most remarkable sights in France – a chapel the Rock of Aiguilhe. The chapel itself is situated on the edge of the town of Puy en Velay and it can be found there for already 1042 years, because it was built by Bishop Gothescalk in 962.